A trip to Hawaii with my family! It's beautiful, tropical, and let's face it... one of my favorite places in the world. It's also my mom's favorite place and I love seeing her in the Aloha spirit ;) It would be most wonderful to spend it with my whole family - including mom, dad, sisters, bro-in-laws (all 4 of them), & MIL. I also hope to travel to Disneyland! TL and I are planning on running the Disneyland Half Marathon on the weekend of our anniversary - so it's the perfect excuse to go! I love that place!! What are your travel hopes/plans for 2011?? Thanks for the comment!! I would LOVE to go to Hawaii! I was thinking of the Disney marathon too...not sure yet though. Such a lucky girl to be going to Europe!! I do love to travel, too and have been all over the world. My husband, not so much & he doesn't like to fly, so these days we keep our trips domestic. I don't mind for now, but when my kids are older I want them to see the world, too. My dad's side of the family is from Egypt, so they definitely have to go there one day! I love the "11 in 2011" concept and I noticed you've got a half marathon on your 2011 list as well! 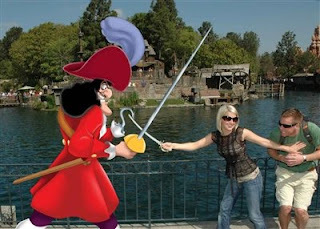 Running around Disneyland would be so much fun! Those are great places! I would love to go to Europe again! I would love to visit Hawaii too! That's definitely one of my longer term goals and I'd love to get my mom out there too. Maybe when the kids are a bit older and can appreciate it more! Thanks for stopping by!! Hawaii...so fun! I want to do the disney marathon in Florida sometime too! Oh my gawsh, if they had a Disneyland in Hawaii, I would move there. Done, I'm building one. all your trips sounds perfect and amazing to me!! I love the picture of you saving TL from Captain Jack! Too cute! I am very lucky in that I will be traveling to Spain and Italy this year on separate occasions. Can't wait! YAY for Disneyland, that's great that you and TL are running it! yay! Oh and you and your fam should so go to Hawaii, have you been before? You will fall in love. I do every time!